The gorgeous oceanfront paradise of Papakea expands over 13 acres of fish-filled lagoons, quaint bridges, beautiful lawns, and colorful tropical landscaping. 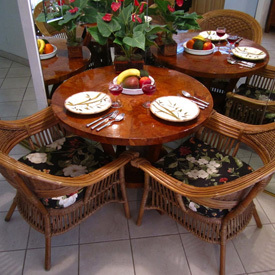 The exquisite burl furniture adds elegance which is rare in a Maui condo. As you lie in your studio's luxuriously comfortable pillow-top king-sized bed, nestled behind a fish pond and sprinkling waterfall, the tall foliage makes you feel you are the only ones on the island. 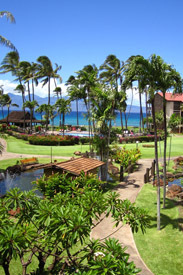 Yet you can stand at your window or relax on your lanai and still see the ocean beyond the beautiful swimming pool. The first thing you notice about the newly-renovated kitchen, in addition to all the latest appliances, is the large cream stone Bali bowl which not only serves as a very effective kitchen sink, but a wonderful conversation piece that contrasts with the deep green granite counters. With the gorgeous ocean beaches and beachfront restaurants only a short walk from your door, you may instead choose to play miniature golf on one of the two professionally landscaped putting greens, play on one of the two oceanfront shuffleboard courts or take a dip into one of the two gorgeous pools serviced by two full hot tubs and saunas. Papakea C-107 provides great luxury at an affordable price.